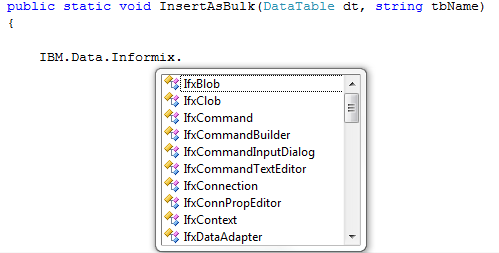 Is there any way to use the SqlBulkCopy class with Informix database, or any alternative, because really I need this class behavior with my Informix database. What I try to do is described in SO 6856004. I don't find IfxBulkCopy at all. If their provider is a good one, the usage of this class should be very similar, if not the same, as the SqlBulkCopy class available for SQL Server. This will likely mean it takes a DataTable or an IDataReader implementation to WriteToServer. Bear in mind it is housed within the "IBM Data Server Provider for .NET", which might be different to where the standard ADO.NET provider stuff is housed.